The Harrison is a spacious ranch-style home with generously proportioned rooms and working areas. A perfect base for a growing family, it has a total of 3,676 square feet of space, while the completed home has a finished floor space of 1,807 square feet. The master bedroom is found at the back corner of the house with its own master bath with a tub, walk-in shower, and walk-in closet. Beside it is the great room where one will find the island kitchen, a pantry, a nook, and the family area. 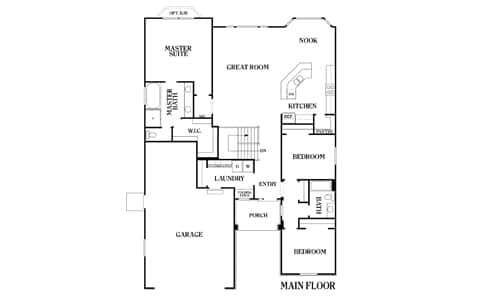 It also has 2 bedrooms, a shared bath, a laundry room, a front porch, and a large garage. Customizing and building a heritage home can be a headache, but not with Perry Homes Utah. With over 40 years of experience in building homes and communities that families love living in, our company offers future homeowners a seamless home design and construction process. We have dedicated design specialists who’ll walk you through every detail and answer any question you may have about the home plan and the construction process. We also have an excellent customer service team who’ll attend to your post-construction concerns even after you’ve moved in. You can count on us to keep you involved throughout the whole process. Give us a call today and find out more about the Harrison and the financing options offered by Perry Homes. You can reach us by calling 801-264-8800 or using our Contact Us page. Start building your Utah home with us today.